During the Middle Ages. the term "artisan" was applied to those who made things or provided services. It did not apply to unskilled labourers. Artisans were divided into two distinct groups: those who operated their own businesses and those who did not. Those who owned their businesses were called masters, while the latter were the journeymen and apprentices. I have made preparations for the next tapestry. On that I will combine my two biggest hobbies, cartography and weaving. Work will be about 1 m2. I use my old Ashford tapestry loom, that the work will be portable. 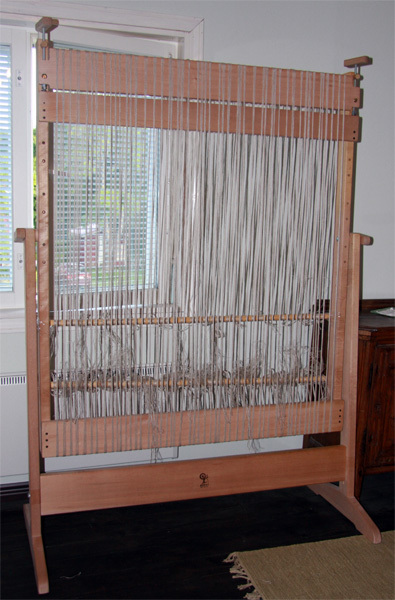 All the warps are done. Just need to tighten them and make a proper knots. I still have a lot of work with the cartoon. I copy individual trees and hills from sheldon tapestries I have photographed. 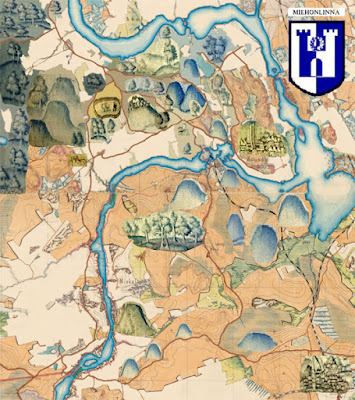 Backround map is 19th century Russian map from Miehonlinna, Aarnimetsä. Even now daddy's little helper wants to use the computer with me. It makes photoshop editing a little hard. Kirjoittaja on keskiajan harrastaja ja elävöittäjä jo vuodesta 2002.